I was going to combine this review with a couple of others, but it turned out I had more to say than I realized! 3 stars: Mostly geared toward increasing productivity in the workplace. As such, I skimmed most of it, but I did pull out a few gems. I often tend to procrastinate, so I was hoping for some solid tips to get me out of that rut. I found a few principles I could apply to my life as a stay-at-home mom, but much of it did not. Hence the skimming. His whole premise is that you should tackle the hardest, most disagreeable job first, whether that's first thing in the morning or first on your list of myriads of other to-do's. Also, the idea that you can train yourself to do this--with sufficient amounts of determination and self-discipline. Okay, I can see how that applies to me. My shower would be a lot cleaner on a consistent basis if I cleaned it first thing every week. The timing would have to be modified though, to be at my first available moment. Life at home is not about big projects or deadlines, but all about taking care of the needs that come up every single day. So maybe if I made a point to tackle whatever task I was putting off that day... Something to think about. I also liked what he had to say about "Launching toward Your Dreams." Basically, don't let fear hold you back. I've been thinking about this in relation to some of my bigger life goals. "Once you have completed your preparations, it is essential that you launch immediately toward your goals. Get started. Do the first thing, whatever it is. My personal rule is "Get it 80 percent right and then correct it later." Run it up the flagpole and see if anyone salutes. Don't expect perfection the first time or even the first few times. Be prepared to fail over and over before you get it right. The biggest enemies we have to overcome on the road to success are not lack of ability and a lack of opportunity but fears of failure and rejection and the doubts that they trigger. The only way to overcome your fears is to "do the thing you fear," as Emerson wrote, "and the death of fear is certain." Another chapter goes into figuring out your key tasks; or in other words, what you do that contributes most to the success of the business/workplace. Once you've identified your top 3 key tasks, then you find out a way to delegate, assign, or let go of all the rest, so you can put all your effort and focus where it will make the biggest difference. Again, translating that into my world as a homemaker, I think one of my "key tasks" is making dinner---with all that entails. Everybody has to eat, and as the only adult home at dinner-making time (usually), it's my job to make sure it gets done. It is also a task that I tend to procrastinate on. So after reading this, I am determined to spend more time making a success of this key task...which means I probably will get back to making a menu in advance, rather than filling it in as I go along! Ha! As I've thought more about this, my plan is to look at the menu in the morning and get started on whatever I can--whether that's preparing side dishes or taking meat out to defrost, so that I avoid the 5:00 p.m. panic. Then there was the chapter on how you should carve out long blocks of uninterrupted time to work on your key tasks. HA HA HA HA! Man, what would that be like? My life as a mother is filled to the brim with interruptions--welcome to raising kids! Trying to make dinner (a "key task") without interruptions? Forget it! Finally, I liked what he had to say about developing a positive mental attitude, particularly the 4 defining behaviors of optimists. "First, optimists look for the good in every situation. No matter what goes wrong, they always look for something good or beneficial. And not surprisingly, they always seem to find it. Second, optimists always seek the valuable lesson in every setback or difficulty. They believe that "difficulties come not to obstruct but to instruct." They believe that each setback or obstacle contains a valuable lesson they can learn and grow from, and they are determined to find it. Third, optimists always looks for the solution to every problem. Instead of blaming or complaining when things go wrong, they become action oriented. They ask questions like "What's the solution? What can we do now? What the next step?" Fourth, optimists think and talk continually about their goals. They think about what they want and how to get it. They think and talk about the future and where they are going rather than the past and where they came from. They are always looking forward rather than backward." I feel that my faith has helped me become more optimistic in these four ways, particularly #2. Since we Mormons believe we are here on this earth to be tested and gain experience, it follows that every experience has some value or something you can learn from. Sometimes finding that nugget of wisdom only happens in hindsight, but it is always there. Overall, there's not much that was new. It's basically a compilation of all the "best practice" time management information that he's come across throughout his career. A quick read, with some valuable points to be learned. p.s. It drives me crazy that there are no page numbers in my ebooks. When I quote from the book I want to put in the page number!! What time management tips do you have for me? Are you an optimist? 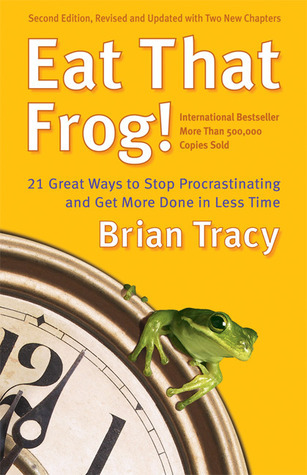 So your most disagreeable or procrastinated task is like eating a big, ugly frog. You just do it first thing and then everything else seems easy. I recently talked to one of my sisters-in-law who only has one kid left at home. She said she used to dream of all she would get done, too, if only she could just be at home by herself. Now she's at home by herself much of the day, and really treasures that time when her family comes home. :) Different stages!